Grave/Memorial Reference: I. D. 39. John Joseph Petre was the cousin of the 16th Lord Petre. He lived with his parents at Tor Bryan in Ingatestone along with his two other brothers, all were mad keen on flying. John Petre was born 11th April 1894 and whilst at school was in the OTC from 1909 until 1913. In Spetember1914, John Petre joined the RNAS and trained at Eastbourne and Eastchurch, and gained certificate number 942 on 14th October 1914. 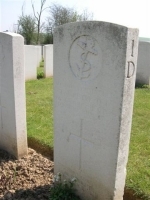 He was posted to RNAS Grain in January 1915 and then on to Dunkirk a month later. By June 1916 he was attached to A Squadron 1 Wing based at St Pol. A squadron 1 Wing was to become Number 1 Squadron in December 1916 with the creation of the RAF. A Wing was often regarded as an HQ for a number of aircraft engaged in offensive duties, scout, reconnaissance work, or bombing. It provided the stores, repair, command medical facilities and even the chaplain! There were often two flights of 5  6 planes in each. The Nieuport Scout was a robust biplane that saw service in many allied squadrons, it had an excellent rate of climb, and was considered superior to most British aircraft that were available at the time. There was a flaw in the design and that was the lower wing which was weak and had a tendancy to disintegrate in flght. John Petre was mentioned in dispatches on 30th December 1915 for his meritorious work in connection with air attack on sheds at Ostende again two months later meritorious work over the enemys lines and recommended for special recognition and reward. He was taking the battle to the enemy and wasnt afraid to do so. John was flying the Nieuport Scout aeroplane, and on May 16th whilst 5000 ft over Dixmude fought an action with a German plane. The latter flew back five miles over the German lines, John Petre chased hlim and despite heavy accurate anti aircraft fire forced him to descend. The London Gazette announced on 22nd June 1916 that John Joseph Petre had been awarded the DSC in recognition of services as a pilot at Dunkirk.